Safety is a prime concern of the Ski Apache Ski Area. The Ski Apache National Ski Patrol’s mission is to keep the skiers and snowboarders safe, respond to medical emergencies and provide customer service on the Mountain. Staying safe at Ski Apache is everyone’s responsibility. Whether you’re a seasoned black diamond rider or just beginning in snow sports, safety is an important part of enjoying the Mountain. Besides our Ski Patrol staff, there are approximately 80 volunteer National Ski Patrol members associated with Ski Apache. All salaried personnel are EMT qualified and the National Ski Patrol members are Outdoor Emergency Care qualified. Many of the National Ski Patrol personnel are also nurses, paramedics and doctors in their regular careers. If you need to contact Ski Patrol, please call (575) 464-3621. Additionally Ski Patrol members participate in a safety and first aid refresher training course each year. If you’d like to consider becoming a member of the Ski Apache Ski Patrol , apply here. … and consider wearing a helmet when riding the slopes at Ski Apache. Please take the time to watch this informational video on skier safety. Mountain Safety At Ski Apache is a top priority. We strive to provide detailed guidelines and rules to adhere to on and off the mountain. 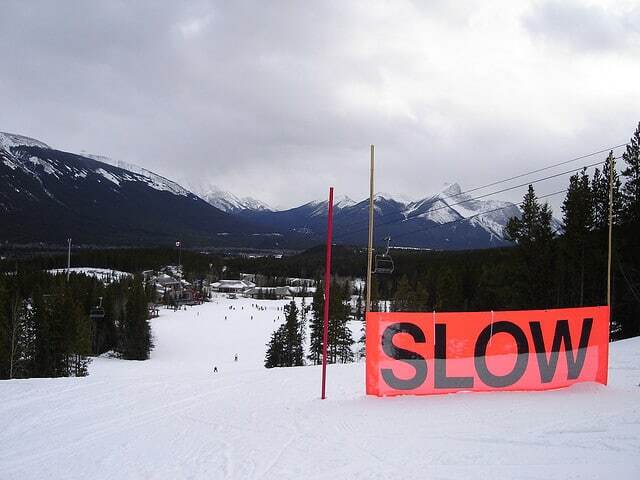 We actively monitor slow zones on the mountain and other high traffic areas across the resort. Continually educate our employees and our guests of things to be constantly aware of in order to ensure safety. Continual safety training with Ski School instructors and lift operators. *Note: All employees in uniform are able to assist with safety questions and are encouraged to enforce safety regulations at the resort. Ski Apache focuses on promoting safety at the resort. While visiting our resort here in New Mexico, you will be joined by skiers, snowboarders, snowshoers, cross-country, skiers, etc. of all skill levels. It is your responsibility to show respect and demonstrate common sense when on the mountain. Understanding your skill set and not pushing yourself beyond your comfort level is important. Stay in Control. Always be ready to stop or avoid objects ahead of you. Skiers and boarders ahead of you have the right of way. Do not stop in the middle of a trail or in a blind spot on the mountain. Always look uphill and yield to others when starting down the mountain. Always use straps to avoid runaway gear. Obey all signs posted. Do not enter closed zones. Before using a lift, understand how to load, ride and unload safely. A skier assumes the risk of any injury to themselves, others or the resort property resulting from the inherent risk of skiing. Constant changing weather conditions; existing and changing snow conditions; bare spots; rocks; stumps; trees; collisions with natural objects, man-made objects, or other skiers; variations in terrain; and the failure of skiers to ski within their own abilities do exist on the mountain. Ski Apache has a Zero Tolerance Policy for skiing out of the areas boundaries or in closed areas. The boundaries are there to protect you. If you are caught going out of bounds or under ropes at Ski Apache you will lose your lift ticket for that day and or even lose your season pass for two weeks minimum. This is to ensure your safety and the safety of others. Specific areas at SkiApache are designated as SLOW ZONES. Ski patrol does monitor the areas daily. Please obey the signs posted in these slow areas by reducing your speed and matching the flow of traffic. Fast and/or aggressive skiing is not tolerated in these areas and will result in getting your pass/ticket pulled. 11,500 ft. Elevation: Altitude sickness is a common occurrence for visitors to SkiApache. Symptoms may include: headaches, nausea, loss of appetite, restless sleep, coughing and difficulty breathing. Allowing your body to adjust and drinking plenty of water is important. Electronic Devices: We discourage the use of electronic devices or any equipment that fully covers your ears to prevent any dangerous situations/distractions on the mountain. Caution Cats Working: We work hard to maintain the mountain to ensure safety. When on the mountain, snowcats and other maintenance vehicles may exist. Avoid these areas when possible. Helmets reduce the chance of injury on the mountain drastically. Today’s helmets are stylish, comfortable and breathable. Helmets are available for rent or purchase at our sports shops and are highly recommended on the mountain. Unmanned aerial drone use by guests or the media is prohibited without prior written approval of Ski Apache Resort. Contact the Marketing Manager at (575) 464-3600 for the approval process.